As you all know, drinking vermouth is a cherished tradition in Spain. And if you didn't believe me when I said it's making a comeback, well, now I have two brothers to back me up. Reader, meet Ferran and Albert Adriá—you may know them from their former number one restaurant El Bullí, which closed in 2011. Not ones to sit still, in 2013 they followed a spate of restaurante openings (Tickets, 41º, etc) with a bar devoted solely to the celebration of vermouth: Bodega 1900. The bar is small, with tile floors and walls and dark wooden accents. It calls to mind bars of old, which is exactly the desired effect. The menu includes smoked meats, salty snacks, and vinegary fish, leaving no vermouth snack cornerstone unturned. The food is where you see why Adriá is Adriá—why the name has soared to the highest heights of the culinary skyline. Everything was spot on. It is so thematic, so almost Disney, that you may want to hate it for a second. But the tastes were all there. The perfect little touches and the hours of work that go into a single tapa, like the trademark spherical olives. Curious as to how they are made? You can watch a video here, and they even have kits that you can use to try it at home. I tasted the house vermouth, and horror of horrors....MARTINI. It tasted like Martini & Rosso. After enquiring, they confirmed my suspicion. It was a blend of two different Martini vermouths, not untasty, per se, just overly sweet, mild, and vaguely industrial. I felt disillusionment, like when you find out Lana del Rey is actually Lizzie Grant + plastic surgery + made-up life story. Adriá made a vermouth bar and sold out on the most important point—the vermouth. Determined to enjoy myself, I decided to agonize over this point later. This dish came out thanks to a misunderstanding between us and the waiter, but I sure am glad it did. Cured tuna, cut with the hand of a sushi master, decorated with a single, toasted Marcona almond. And no vermouth hour would be complete without some preserved seafood. Yes, you heard me right....mussels, clams, sardines, you name it. 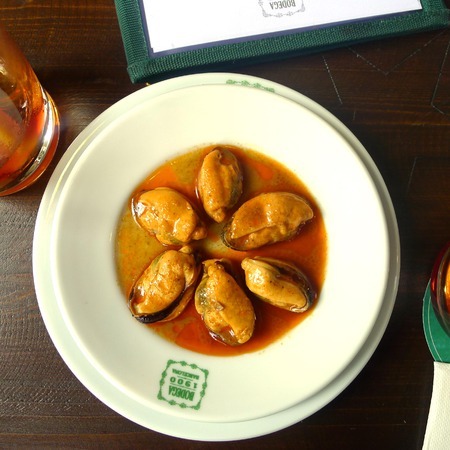 Canned fish is considered to be an excellent pairing for vermouth, and at Bodega 1900 they do not disappoint (see our huge plate of plump mussels). They've even turned their hands to a full line of conserves, including mussels, asparagus, and olives. I like these guys. They know how to stay busy. Our final snack was probably my favorite. Some world-class fried calamari, small, delicate, and perfectly breaded, served on a warm roll with housemade aioli and a slightly piquant red sauce. Here's to health, happiness, hipsters and vermut!